Ahmed Mohamed, center, was on his way to meet with an attorney earlier today. 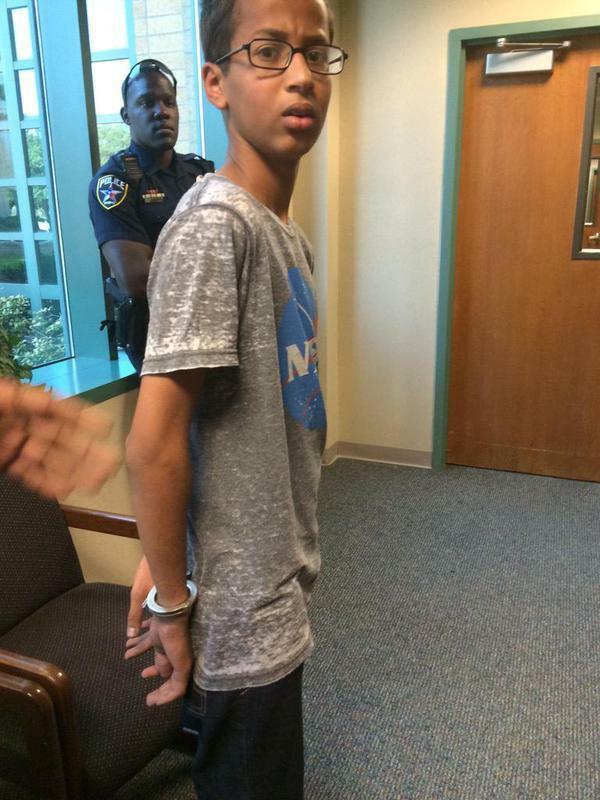 This picture, posted on Twitter and reportedly taken by a family member, shows Ahmed Mohamed in handcuffs. 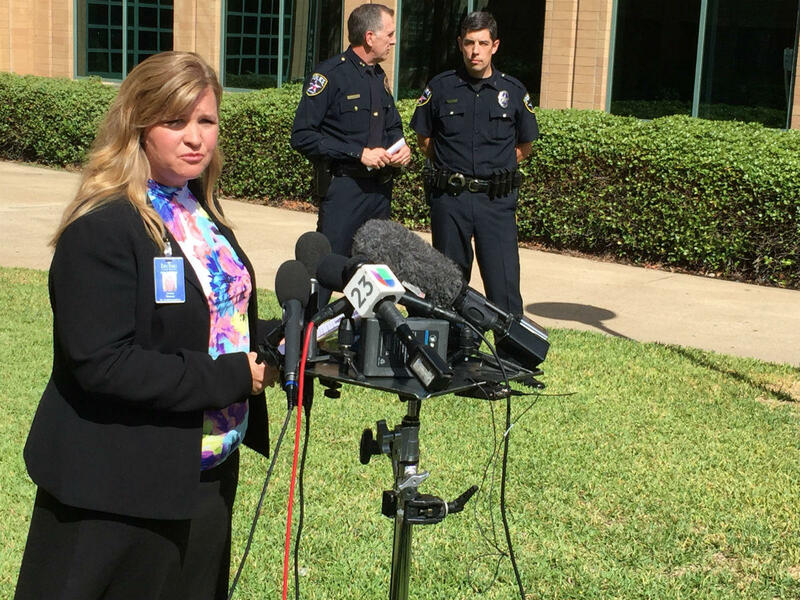 Irving school district spokeswoman Lesley Weaver addresses reporters Tuesday morning. 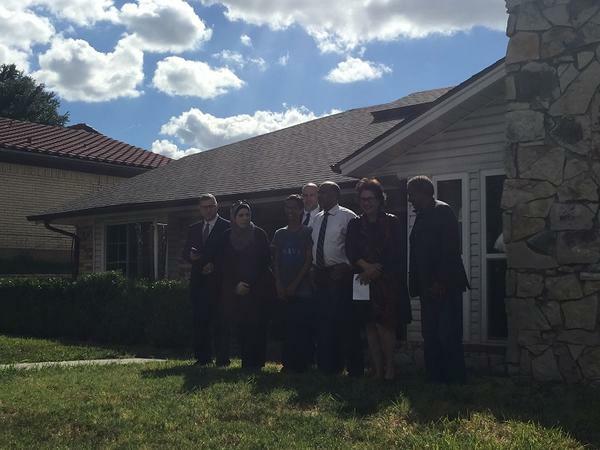 Ahmed Mohamed was surrounded by family members at a press conference Wednesday afternoon in Irving. Irving police say they won’t file charges against a Muslim teenager who brought a homemade clock to school that was mistaken for a bomb. Ahmed Mohamed, 14, was arrested on Monday. He says he plans on transferring schools. And now he's a social media sensation. President Obama tweeted him, inviting him to the White House. Facebook founder Mark Zuckerberg praised him. On Twitter, the hashtag #IStandWithAhmed was trending, with people around the world posting supportive messages -- and pictures of clocks. Mohamed likes gadgets. He likes inventing things. He was in robotics club in middle school. On Monday, wearing a NASA T-shirt, he brought in a digital clock made from circuit boards and wires he threw together the night before. “I built a clock to impress my teacher," Mohamed said. He showed it off to an engineering teacher, who told him to keep it to himself. Later, in English class, the clock sounded off -- from inside his bag. School officials contacted police. Mohamed says an officer and the principal took him to a room filled with several officers, who questioned him. He says he was asked if he was trying to make a bomb. Mohamed’s family is Muslim. His dad immigrated from Sudan. On Wednesday, Irving police chief Larry Boyd defended his department, saying this would have happened, regardless of Mohamed’s race or religion. Lesley Weaver, a spokeswoman for the Irving school district, says its protocol is to ask students and staff to flag any suspicious items or behaviors. “If something is out of the ordinary, the information should be reported immediately to an administrator and or the police so that it can be addressed right away,” Weaver said. That sort of no-tolerance atmosphere? It’s common in schools around the nation. Last week, an eighth grade boy in Maryland made headlines. He was arrested and charged with assault for kissing a girl at school on a dare. But others in Irving, and online, say there’s more going on. The city has a couple hundred thousand residents with a growing South Asian population -- and a recent history of anti-Muslim sentiment. “Definitely, the environment the mayor has created in the city of Irving has been very different than what it used to be six to eight months ago,” said Tariq Jaffery, with the local chapter of the Council on American-Islamic Relations. Jaffery is talking about Irving mayor Beth Van Duyne. She became notorious for her anti-Muslim sentiments earlier this year. But mosque leaders said Van Duyne was just trying to stir up anti-Muslim sentiment. They say they had been simply offering to mediate disputes among members – mediations that were voluntary. “We asked the members of the mosque, are you supportive of the American laws, are you supportive in following the Texas state statutes,” Van Duyne said earlier this year. Obama says the clock is "cool"
As for Mohamed? His passion for science and technology landed him in handcuffs. He says that didn’t feel so great. “It made me feel like I wasn’t human, it made me feel like a criminal,” Mohamed said. A criminal in his eyes at the time. But to others now, he’s a role model. President Obama tweeted at Mohamed today. Obama called the clock “cool” and said Mohamed is an inspiration. White House press secretary Josh Earnest called the arrest a "teachable moment." Though Mohamed says he will no longer take his inventions to school, the president invited him to bring his clock to the White House. Mohamed told reporters Wednesday he plans to transfer to another school. 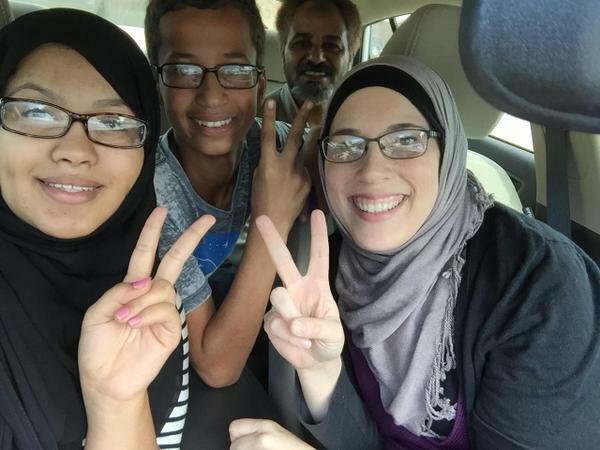 Ahmed Mohamed and his family spoke with reporters in Irving Wednesday afternoon. He said he plans on transferring schools. He eventually wants to attend MIT. He also gave advice to students who want to show their talents: "Go for it. Don't let people change who you are." The White House says Ahmed Mohamed was "failed" by his teachers who thought a clock made by the teen was possibly a bomb. White House press secretary Josh Earnest called the episode involving Mohamed a "teachable moment." Earnest's comments followed a tweet by President Barack Obama offering support for the teen. Mohamed was invited to participate in an astronomy night the White House is organizing next month with leading scientists. Earnest says the invitation was offered as a way for Ahmed to "nurture that intellectual curiosity." Add Mark Zuckerberg to the list of famous people reaching out to Ahmed Mohamed, the Irving teen arrested for bringing a homemade clock to school that was mistaken as a bomb. The founder and CEO of Facebook posted on -- what else -- Facebook: "Having the skill and ambition to build something cool should lead to applause, not arrest. The future belongs to people like Ahmed. Ahmed, if you ever want to come by Facebook, I'd love to meet you. Keep building." Irving Mayor Beth Van Duyne, who’s generated national attention in the past for her comments on Muslims, issued a statement on her Facebook page on Wednesday. "I do not fault the school or the police for looking into what they saw as a potential threat," Van Duyne wrote. "They have procedures to run when a possible threat or criminal act is discovered. They follow these procedures in the sole interest of protecting our children and school personnel. To the best of my knowledge, they followed protocol." Van Duyne later amended her Facebook post, adding: "As a parent, I agree that if this happened to my child I would be very upset. ... Hopefully, we can all learn from this week’s events and the student, who has obvious gifts, will not feel at all discouraged from pursuing his talent in electronics and engineering." Earlier this year, Van Duyne generated national attention after she "accused mosque leaders of creating separate laws for Muslims," The Dallas Morning News reported. Mosque leaders were offering to mediate disputes among members, and said the mediations were voluntary and non-binding, the newspaper reported. No charges will be filed against Ahmed Mohamed, the 14-year-old who was arrested after bringing a clock to school that was mistaken for a bomb. “The follow-up investigation revealed it was apparently a homemade experiment and there’s no evidence to support the perception he intended to create alarm,” Larry Boyd, the Irving police chief, said at a press conference this morning. Boyd plans to meet this afternoon with Mohamed’s father. Mohamed, who loves tinkering with electronics, took the clock to MacArthur High in Irving on Monday. The clock that Mohamed built looked "suspicious in nature," police said. Mohamed was detained and released to his parents. He's been suspended from school for three days. School district spokeswoman Lesley Weaver says officials were concerned with student safety and not the boy's Muslim faith. Many are going online to show their support for Mohamed, using the hashtag #IStandWithAhmed. President Obama has invited Mohamed to the White House, calling the clock "cool" on Twitter. The MacArthur High principal sent a letter to parents on Tuesday, saying the safety of students is "always our top priority" and that the school will "always take necessary precautions" to protect students. "We are handling the situation in accordance with the Irving ISD Student Code of Conduct and applicable laws," principal Dan Cummings wrote. "I recommend using this opportunity to talk with your child about the Student Code of Conduct and specifically not bringing items to school that are prohibited. Also, this is a good time to remind your child how important it is to immediately report any suspicious items and/or suspicious behavior they observe to any school employee." On Wednesday, school district spokeswoman Lesley Weaver told reporters that what's been reported so far about Mohamed's case has been "very unbalanced" but that the district is restricted from releasing additional details due to student privacy rights. School officials continue to cooperate with the police investigation. A 14-year-old Muslim boy has been arrested in North Texas after a high school teacher decided that a homemade clock he brought to class could be a bomb. But one teacher raised concerns that it looked like a bomb, prompting the school principal and several police officers to question him, search his belongings and march him from the school in handcuffs. Police don't believe the device is dangerous, but say it could be mistaken for a fake explosive. Mohamed was suspended from school for three days, but he has not been charged.